One of the most studied home movies in history, the Zapruder film shows the assassination of JFK – in 26.6 seconds on 486 frames. Experts still debate what exactly is shown – or not shown – in the Zapruder film. What do you see? Explore the Zapruder Film Timeline. As tens of thousands of people greeted President Kennedy in downtown Dallas, Abraham Zapruder filmed two of his employees waiting near a grassy knoll just a block from Jennifer Juniors, Zapruder’s clothing company. Receptionist Marilyn Sitzman waved to the camera as payroll clerk Beatrice Hester sat with her husband, Charles, on a nearby bench. “Mr. Z” then climbed atop a concrete abutment and waited. Sitzman supported him in case Zapruder became dizzy. He stood 65 feet from the center of Elm Street. Zapruder filmed the Kennedy limousine after it turned onto Elm Street and captured the entire assassination—the only photographer to do so. He used a Bell & Howell Model 414PD Zoomatic Director Series camera with a Varamat 9-27mm f1.8 zoom lens, set for full close-up. Its 8mm Kodachrome II color film moved through the camera at an average speed of 18.3 frames per second, as determined by later tests. Zapruder continued filmed after the shooting, which took less than 10 seconds. He and Sitzman jumped down and walked into the shelter of a nearby pergola as the Hesters crouched on the grass. Zapruder and Sitzman soon became separated. Reporter Harry McCormick of the Dallas Morning News, having raced from the Dallas Trade Mart where Kennedy was headed, noticed Zapruder in Dealey Plaza and learned what happened. Zapruder would speak only with federal investigators, so McCormick said he would contact Forrest Sorrels, the head of the Dallas Secret Service office, for him. Dallas Times Herald reporter Darwin Payne ran to nearby Dealey Plaza after getting word of the shooting. He heard of Zapruder and his film from two of his employees (probably Sitzman and Hester) standing outside the Texas School Book Depository. Payne then went to Zapruder’s office across the street for an interview. Payne interviewed Zapruder and tried to get publication rights for the newspaper. McCormick arrived with Sorrels and headed to Zapruder’s office. When Payne objected to the competing reporter’s exclusive presence, McCormick and Payne were ejected. Zapruder offered to get Sorrels a copy of his film. Zapruder, his business partner, Erwin Schwartz, and McCormick and Sorrels departed for the nearby Dallas Morning News to develop the film. Payne was left behind. Since the Dallas Morning News had no film-processing capability, the foursome walked next door to Dallas’ ABC network affiliate, WFAA-TV (which was co-owned with the Dallas Morning News). WFAA assistant news director and chief photographer Bert Shipp called Kodak, asking them to process the 8mm color film, since the station had only 16mm black-and-white film equipment. Zapruder appeared live on ABC and WFAA with WFAA’s program director, Jay Watson, while Schwartz stood nearby holding the camera with the film. Zapruder, Schwartz, and Sorrels, riding in a Dallas police car, arrived at the Kodak lab near Dallas Love Field about the time Air Force One took off for Washington with Kennedy’s body. Kodak personnel, using a special viewer, watched the film once to determine if the processing was correct. Kodak manager Phil Chamberlain then declined to show it again for fear of accidental damage. Since Kodak had no facilities to make copies, Zapruder and Schwartz drove to Jamieson Films in Dallas to have prints made for investigators. Only three rolls of film were available at either Kodak or Jamieson. Zapruder and Schwartz returned to Kodak to have the prints processed and made available for projection. Schwartz and Zapruder delivered two prints to Sorrels. Sorrels asked them to take one to the Dallas Naval Air Station in nearby Grand Prairie, where a jet was immediately dispatched to take the print to FBI investigators in Washington, D.C.
Life magazine’s Pacific Bureau editor, Richard Stolley, who immediately flew from Los Angeles to Dallas after hearing of the assassination, reached Zapruder at his home by phone and arranged to meet in his office at 9:00 a.m. the next day. Stolley arrived at Zapruder’s office an hour early and waited. Zapruder screened the film for Secret Service agents, then met with Stolley and agreed to sell only print rights of the film to Life. He expressed concern that the film not be exploited. Stolley left with the original film, which was couriered to Life‘s editorial office and printing center in Chicago (Zapruder kept the remaining print). Life personnel examined the film to decide which frames to publish. At some point, they accidentally damaged the original film in two places, and six frames were removed, leaving visible splice marks. A second color home movie, made by Charles Bronson—from one block away and showing the fatal shot to Kennedy—was dropped off at Kodak with a note that the film included the assassination. FBI agents watched the film with Bronson the next afternoon but found nothing of importance to their investigation. Life publisher C.D. Jackson, after viewing a copy of the Zapruder film in New York, instructed Stolley to purchase remaining television and movie rights for a price that eventually reached $150,000 plus royalties; the purchase included Zapruder’s copy of the film made in Dallas the afternoon of the assassination. Zapruder donated the first $25,000 to the widow of Dallas Police Officer J.D. Tippit, who was killed 45 minutes after the assassination when he stopped Lee Harvey Oswald in the Dallas neighborhood of Oak Cliff. A third color home movie, filmed by Marie Muchmore and showing the fatal shot from a different angle, was purchased by United Press International (UPI), processed in Dallas at Kodak and flown to New York City. A description of the film’s contents with several color frames was sent to UPI subscribers, and the entire film appeared the following day on WNEW-TV in New York City. UPI and the Associated Press (AP) obtained rights from Life magazine to distribute seven frames of the Zapruder film to subscriber newspapers and magazines around the world to promote Life‘s new issue, which included many additional frames. Zapruder granted a brief radio interview to Don Michel of WRAL in Anna, Illinois. Life published 31 black-and-white frames in its quickly revamped weekly issue, then printed nine frames in color two weeks later in a special memorial edition. A fourth color home movie, filmed by Orville Nix, of the fatal shot was processed and loaned to the FBI in Dallas. Nix sold the film to UPI in New York five days later. The FBI borrowed Zapruder’s camera for testing. On December 20, the bureau concluded, “This camera when operated at normal ‘run’ speed operates at 18.3 frames per second.” This “clock” was later used to determine the timing of specific events as seen in the film. Warren Commission members studied copies of the Zapruder film for a week with members of the FBI and the Secret Service. Life showed the original film several times to Warren Commission, FBI and Secret Service personnel, and then offered to make 35mm color slides of frames 171-334, which covered what was thought to be all of the assassination. The Secret Service produced a 22-minute educational film titled, Assassination of President John F. Kennedy. The film was made in cooperation with the Dallas Police Department and Chief Jesse Curry and included Secret Service special agents John Joe Howlett and Talmadge Bailey. Dallas CBS affiliate KRLD provided production facilities. The film was supervised by KRLD news director Eddie Barker, narrated by Jim Underwood and filmed by Underwood and Henk Dewit. The film included re-creations of the motorcade route, the assassin’s actions immediately after the shooting and a black-and-white version of the Zapruder film copy held by the Secret Service. The Warren Commission conducted a series of field study tests with the Zapruder camera in Dealey Plaza. Following the tests, on June 23, the camera was returned to Bell & Howell, who had offered to exchange it with Zapruder for a newer model. Life‘s Warren Report issue, which came out just one week after the report’s release, featured several color frames from the film, including one of the gruesome head shot. Shortly after the press run began, Life stopped the presses and replaced that frame with one that was much less graphic. Not long after resuming the press run, Life changed the new frame’s caption, resulting in another costly shutdown. The Warren Commission published 26 volumes of evidence, with black-and-white reproductions of frames 171-334, including the area between the sprocket holes not normally seen when projected. The Government Printing Office printed approximately 3,500 sets. Freelance New York reporter Marvin Scott interviewed Zapruder in Dallas about his film and the assassination. In 2003, Scott donated his original tapes of the interview—which include an interview with Zapruder’s receptionist, Marilyn Sitzman—to The Sixth Floor Museum at Dealey Plaza. Life magazine questioned the Warren Report, asking “Did Oswald Act Alone? A Matter of Reasonable Doubt.” The black magazine cover featured all of Zapruder frame 230. After testing the camera’s average running speed, which matched the FBI’s earlier measurement of 18.3 frames per second, Bell & Howell donated the Zapruder camera and carrying case to the National Archives and Records Administration (NARA). Time Inc., parent company of Life magazine, registered a copyright on the original Zapruder film. Zapruder appeared in part two of the television special, CBS News Inquiry: The Warren Report, in an interview with Dallas newsman Eddie Barker filmed in Dealey Plaza. Life hired a New Jersey film lab, Technical Animations, to make a 35mm film copy of the original 8mm Zapruder film. Vice President and General Manager Moses Weitzman made several copies, gave the best one to Life and kept the rejects. In New Orleans, Zapruder testified for the prosecution in the Jim Garrison investigation into a possible Kennedy conspiracy involving Clay Shaw. During the film’s first public showing, Zapruder confirmed its authenticity. Garrison showed the film to the jury 10 times. In an evening news program, Los Angeles station KTLA aired a copy of the Zapruder film, narrated by anchor Hal Fishman. The broadcast included reports of the day’s testimony in the Clay Shaw trial in New Orleans. Abraham Zapruder died of cancer in Dallas. Time Inc. asked the National Archives if it would be interested in acquiring the film as a donation. Legal complications prevented further discussions. Researcher Robert Groden premiered his enhanced film at a conference at Boston University, sponsored by the conspiracy-oriented Assassination Information Bureau. The showing caused a sensation. As a Technical Animations employee in 1969, Groden had copied a Weitzman print and stored it in a bank vault. Between 1969 and 1975, using an optical printer, he made multiple copies with special effects, such as close-ups and repositioning, to remove shakiness and improve clarity. Groden showed his enhanced film to the Rockefeller Commission looking into CIA activities. Also present was David Belin, executive director of the Rockefeller Commission and former Warren Commission counsel. ABC News reporter Geraldo Rivera convinced network executives to show Groden’s version of the film on his weekly Good Night America talk show. It was the first time the film appeared on network television. Many believed the backward movement of the president’s head and upper body “proved” the fatal shot came from the front, not from behind in the Texas School Book Depository. Time, Inc. transferred the copyright and film to the Zapruder family. Two days later, the family—widow Lillian, son Henry and daughter Myrna—formed the LMH Company to manage the film. Shortly afterward, NARA agreed to store the film as a courtesy. Virginia congressman Thomas Downing and others watched Groden’s copy of the film and two days later introduced a resolution that led to the creation of a House Select Committee on Assassinations (HSCA) 17 months later. The HSCA re-examined the JFK and Martin Luther King, Jr. murders, concluding both were probably the result of conspiracies, but that Lee Harvey Oswald and James Earl Ray were the respective assassins. Starting with a CBS News special and followed by a 1980 BBC documentary produced by journalist Anthony Summers, the Zapruder film—and still frames from it—was licensed for occasional news and documentary use. Director Oliver Stone’s dramatization of the discredited Garrison investigation in the movie JFK revived doubts about the assassination, and the big-screen Zapruder images contributed to further questions about withheld evidence. Responding to public outcry over government secrecy surrounding parts of the assassination, Congress passed a bill—known as the JFK Act—creating an Assassination Records Review Board (ARRB) to oversee the release of all classified federal records about all aspects of the assassination and subsequent investigations. The Zapruder family sought the return of the original film from NARA. The Zapruder family again asked for the return of the film, but NARA declined, citing the 1992 JFK Act. The ARRB formally defined the scope of assassination records to include any records, whether public or private, that are “reasonably related” to the assassination. The ARRB met to discuss photographic records relating to the assassination and the Zapruder film, specifically. The ARRB met with the Eastman Kodak Company to seek scientific advice and analysis of the Zapruder film and other photographic records. Kodak scientists James Milch and Roland Zavada examined the original Zapruder film and two first-generation copies at NARA for the ARRB. The Zapruder camera was loaned from the National Archives to The Sixth Floor Museum at Dealey Plaza in Dallas. The camera was displayed for five years as part of the Museum’s “The Photographers and The Evidence” exhibition. Zavada prepared a preliminary findings report and met with the ARRB. Doug Horne of the ARRB staff presented a description report of all Zapruder film copies held by NARA. The ARRB declared the Zapruder film an assassination record and moved to acquire it under constitutional guidelines requiring fair compensation to the owner. Complications arose when appraisers estimated the film’s value in the millions of dollars. The ARRB held a public hearing for recommendations concerning the original Zapruder film and the possibility of confiscating the film. The ARRB decided unanimously to confiscate the film by designating it an assassination record. Through June and July, the ARRB met with five former Dallas Kodak lab employees to verify how the film was handled and processed the day of the assassination. Kodak rehired retired scientist Zavada to oversee and prepare a study of the film and final report for the ARRB. Kodak representatives met with the ARRB to finalize responsibilities and fees, and they eventually donated $11,000 worth of time and expertise for Zapruder film analyses. Zavada conducted a second examination of the original Zapruder film and copies held by NARA. The Zapruder film, in a newly restored and digital format, debuted as a documentary video produced by MPI Home Video, in cooperation with the Zapruder family. Researchers complained that the images were distorted due to analog-to-digital production errors. Ownership of the Zapruder film was officially transferred to the JFK collection at NARA as established by the JFK Act, but the Zapruder family retained all copyrights. Zavada’s lengthy final report authenticating the film as being the camera-original was presented to the ARRB. A special arbitration panel of the Justice Department awarded $16 million plus interest to the Zapruder family as compensation for the government’s acquisition of the film. The Zapruder family donated their collection of Zapruder films and photographs, along with all copyrights to the film, to The Sixth Floor Museum at Dealey Plaza. A fifty-eight year-old Dallas businessman in 1963, Abraham Zapruder co-owned the dress manufacturing company, Jennifer Juniors, Inc., located in the Dal-Tex building at 501 Elm Street, across Houston Street from the Texas School Book Depository. A native of Russia, where he was born in 1905, Zapruder immigrated to the United States at the age of fifteen, settling in Brooklyn, New York, where he soon learned the textile trade. In 1941 he moved his family to Dallas, where he became active in the local Jewish community, attending the prominent Temple Emanu-El. An avid amateur photographer, Zapruder had intended to bring his Bell & Howell 8mm Zoomatic movie camera to the office on November 22, 1963, for the rare chance to photograph the President of the United States. Although he accidentally left it at home that morning, his longtime assistant, Lillian Rogers, convinced him to retrieve it before the motorcade arrived. Zapruder chose to capture his home movie from an elevated concrete pedestal on the northwest side of Dealey Plaza. Steadied by his assistant, Marilyn Sitzman, Zapruder witnessed the assassination through the viewfinder of his camera. He was haunted by this experience for the remainder of his life, guarding his family’s privacy and granting few interviews over the years. Abraham Zapruder died in 1970 at the age of sixty-five. What the Zapruder film shows? The film shows President Kennedy and his motorcade in Dealey Plaza in downtown Dallas as shots are being fired. The film shows the presidential limousine as it travels west on Elm Street toward the triple underpass. The Texas School Book Depository, the building where investigators found empty shells and a rifle, was out of view to Zapruder’s left. A grassy knoll, from where some believe a second assassin fired, was out of view to his right. Why the Zapruder film was not shown to the public right away? When Abraham Zapruder sold his film to LIFE magazine the day after the assassination, it was with the understanding that the magazine not exploit the graphic details of the president’s death. LIFE executives agreed to withhold the film from public exhibition until emotions cooled down. The film was first aired on television by Geraldo Rivera on March 6, 1975, on the ABC show Good Night, America. If some of the Zapruder frames are "missing"? Six frames, from two different parts of the original film, were accidentally damaged by Life magazine personnel while they were preparing pictures for publication. Fortunately, three duplicate copies were made of the original film before the damage occurred. Two of those films are stored at the National Archives in Washington, D.C., and the third is in the Museum’s Zapruder Collection. The copy now in the Museum’s collection was apparently also damaged when it was at LIFE and it, too, may be lacking one or two of the “missing” frames. All frames of the film are accounted for at the National Archives. That the Zapruder film is not the only film of the assassination? 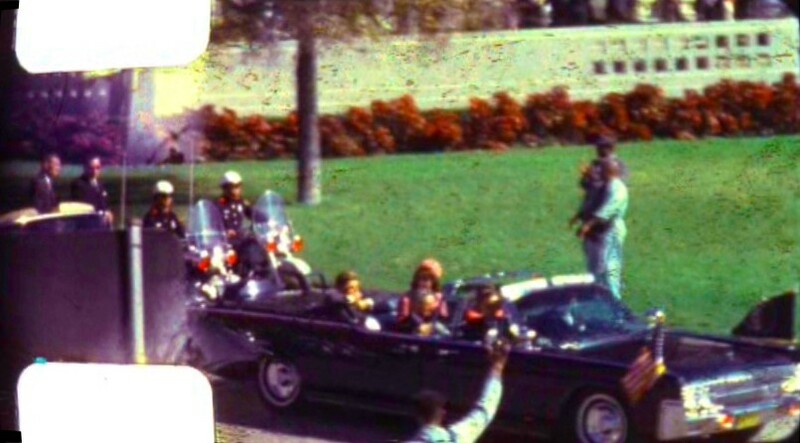 While the Zapruder film is the only film known to exist showing ALL of the shooting, three other home movies show part of the assassination, and as many as five still photographers took at least one picture while shots were fired. Several others made pictures immediately before or after the assassination. At least three photographers remain unidentified and their pictures, if any, are unseen. That the Zapruder film is silent? Abraham Zapruder was using an 8mm Bell & Howell home movie camera to film the president. Home movie cameras in those days did not have sound capability. You can learn more about the film by visiting our Zapruder Film FAQ and Zapruder Film Timeline. You can view the film itself on the Museum’s collections database. For further reading, see The Zapruder Film: Reframing JFK’s Assassination (David Wrone, 2003), National Nightmare on Six Feet of Film: Mr. Zapruder’s Home Movie and the Murder of President Kennedy (Richard Trask, 2005), and LIFE The Day Kennedy Died: Fifty Years Later (LIFE, 2013). For documentary viewing, see Image of an Assassination: A New Look at the Zapruder Film (MPI Home Video, 1998). For conclusions reached by the Assassination Records Review Board, see Chapter 6, Part II, which includes reference to an examination and report on the film by Eastman Kodak Company 8mm film expert Roland Zavada.